"So I tell you, continue to ask, and God will give to you. Continue to search, and you will find. Continue to knock, and the door will open for you. Yes, if a person continues asking, that person will receive. If a person continues looking, that person will find. And if a person continues knocking, the door will open for that person." "Don't quit!" Jesus says repeatedly. "Don't give up! Keep on knocking, seeking, and asking! 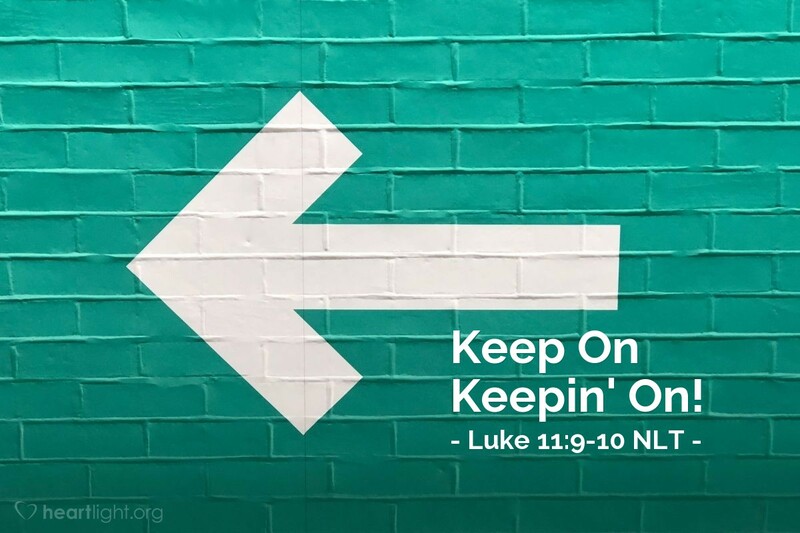 Keep on keepin' on because God will answer you!" Rather than spending a lot of words on what we're supposed to do, let's just hear Jesus tell us to keep on doing it! Father, you know that I have had several things on my heart. I now ask that you hear me once again and act in your great might and for your glory and accomplish your will in the following areas ... I ask it all in Jesus' name. Amen.